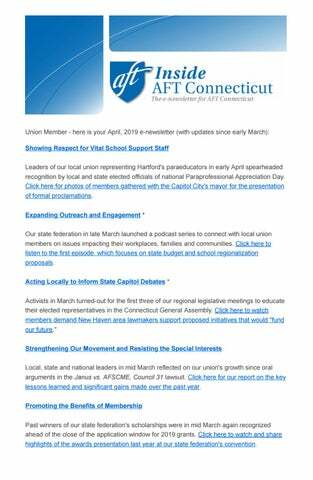 Union Member - here is your April, 2019 e-newsletter (with updates since early March): Showing Respect for Vital School Support Staff Leaders of our local union representing Hartford's paraeducators in early April spearheaded recognition by local and state elected officials of national Paraprofessional Appreciation Day. Click here for photos of members gathered with the Capitol City's mayor for the presentation of formal proclamations. Expanding Outreach and Engagement * Our state federation in late March launched a podcast series to connect with local union members on issues impacting their workplaces, families and communities. Click here to listen to the first episode, which focuses on state budget and school regionalization proposals. Acting Locally to Inform State Capitol Debates * Activists in March turned-out for the first three of our regional legislative meetings to educate their elected representatives in the Connecticut General Assembly. Click here to watch members demand New Haven area lawmakers support proposed initiatives that would "fund our future." Strengthening Our Movement and Resisting the Special Interests Local, state and national leaders in mid March reflected on our union's growth since oral arguments in the Janus vs. AFSCME, Council 31 lawsuit. Click here for our report on the key lessons learned and significant gains made over the past year. Promoting the Benefits of Membership Past winners of our state federation's scholarships were in mid March again recognized ahead of the close of the application window for 2019 grants. Click here to watch and share highlights of the awards presentation last year at our state federation's convention. Boosting Our Extended Labor Family Local activists in mid March traveled to Montana to represent Connecticut and participate in an internal membership engagement and organizing drive coordinated by AFT. Click here for a photo of the team of public employee union members celebrating what they accomplished together. Sharing Our Advocacy with a Global Community AFT Connecticut President Jan Hochadel in early March spoke in New York City to an audience of labor leaders and activists from around the world. Click here to share Public Service International's CSW63 blog report on the event with colleagues on social media. Organizing In-District Professional Learning for Members Teachers in Meriden in early March received Google G Suite software training coordinated by our local and national unions in collaboration with district administrators. Click here for photos of members learning to apply the digital literacy curriculum to meet their classroom needs. Upcoming Activities & Events April 6 - April 23: Regional Legislative Meetings (3 locations) * April 6: PreK-12 Teachers' Pre-Retirement Seminar April 24: "Organizing 101" Training Workshop for Union Leaders April 25: Website Communications Training for Union Leaders April 26: Connecticut AFL-CIO Capitol Workers Memorial Day Ceremony May 1: Students with Attention & Learning Issues Workshop for Teachers & PSRPs May 18: AFT Connecticut 72nd Annual Business Convention May 21: Local Union Treasurer's Training Workshop Featured Benefit AFT +: Southwest Airlines SWABIZ Discounts Stay Informed Click here to sign-up for e-mail updates. Click here to "like" our Facebook page. Click here to follow our Twitter feed. Click here to subscribe to our YouTube channel. Click here to subscribe to our Podbean channel. 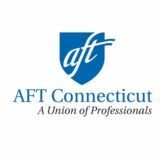 * Political info; dues-paying members can change their e-mail update content preferences by sending e-mail to ActNetReply@aftct.org. April 2019 "Inside AFT CT"